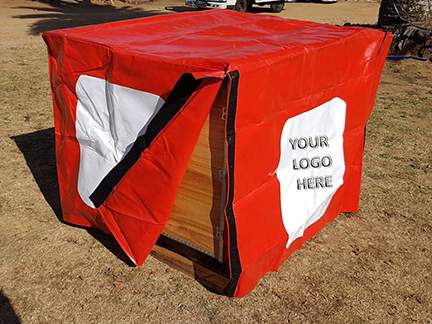 Pallet covers are a re-usable goods wrap protecting the product from rain, dust and losses on route. Common applications are for transporting bricks, cement, sweets and other edible products. These are made from durable 550g or 700g PVC tarpaulin material. Sizes are made to fit a standard South African pallet size of 1.2m x 1.0m and of various heights according to customers specifications. Other pallet sizes can be made on request.